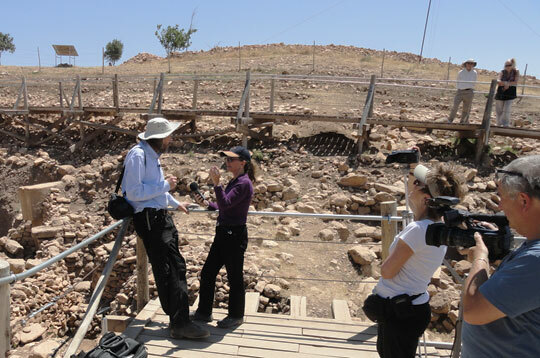 Earthfiles Reporter and Editor Linda Moulton Howe interviewed Robert M. Schoch, Ph.D., Geologist, Boston University, inside the Gobekli Tepe, Turkey, excavation site on June 13, 2012. Right is Jennifer Stein running video camera for Linda and Leo Skorpion, videographer, Skorpion Film Production. Image by Gregory Poplawski for Earthfiles.com. 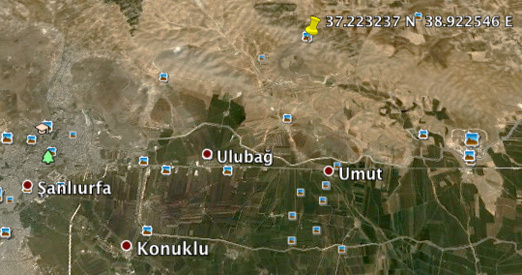 Yellow marker at coordinates for Gobekli Tepe: 37.223237° N, 38.922546° E Gobekli Tepe in Turkish means “Potbelly Hill,” an archaeological site about eight miles northeast of Sanliurfa not far from the Syrian border. The region's water comes from the Euphrates, the longest river of Western Asia, that originates upstream from Keban, Elazig Province in eastern Turkey. June 26, 2012 Gobekli Tepe, Turkey - After the sun had risen to completely light up Gobekli Tepe, I interviewed geologist Robert M. Schoch, Ph.D., inside the Gobekli Tepe excavation. I asked him if given that Gobekli Tepe's creation and purpose is perhaps the greatest archaeological and historical mystery on the planet today, what does Dr. Schoch speculate happened a thousand years after the elegant, bizarre, strangely eerie pillars, totem, Urfa man and other sculptures were erected in circles over 30 hilltop acres to cause Someone to cover the whole site back over with dirt? Previous PostPrevious Part 3: Mysterious 12,000-Years-Old Gobekli Tepe – Buried to Escape Incoming Comets? Meteorites? Huge Solar Flares?